Dove.Org is growing! Protecting the original mission and vision of the founding fathers, we’re working to develop a new level of influence in a new season of digital and on-demand entertainment. We know that Dove Families love entertainment and want to be informed. As people of faith, we also want to stay in the conversation long enough to listen and learn… and discuss! The Dove reviews are based on Christian values and we want to serve all families and individuals who love great entertainment, but also want to spend their time and money on God-glorifying storytelling. We also recognize that our families might have unique sensitivities, so we want to bring you insight and information so that you can make informed decisions. We don’t pretend to know your family better than you do, but we will give you a point of view through as much of a biblical lens as we are able. And we’ll grow and learn through your feedback. We’ve added to our content grid, so you can see quickly the good, the bad and the ugly, and you an choose the right movie for your particular tastes and sensitivities. Our new seals are explained HERE. 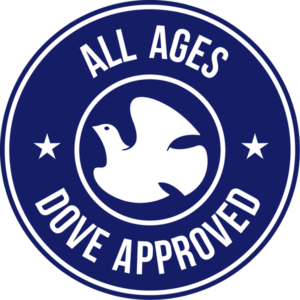 The Dove Approval criteria has not changed – we’ve only consolidated the seals to be clearer. For example the 18+ seal is reserved for God-glorifying messages that have more mature elements according to our criteria. Here is a link to our detailed criteria. Years ago, the Dove Seal was referred to by the late entertainment legend, Steve Allen as “the Good Housekeeping seal for family entertainment.” We honor that legacy and we’re excited to carry it forward for a new generation of families. The Dove Foundation incorporated as a not-for-profit organization and began its work producing the first list of movies with the Dove “Family-Approved” Seal. Dove produced “Hollywood’s Impact on Family Values,” a television special hosted by entertainment legend Steve Allen. The Dove Movie Channel® for hospitalized children debuted in partnership with Ronald McDonald Children’s Charities, thanks to a grant from the Prince Foundation; later reaching over 30 hospitals. The Dove Foundation commissioned it’s first Profitability Study of MPAA-Rated Movies to examine revenues and negative costs for widely released movies from 1988-1997. The study was updated again in 2005 and in 2012. Twentieth Century Fox Home Entertainment began to include the Dove “Family-Approved” Seal on nationally marketed Dove approved DVDs. Many other studios have followed suit. Dove has trust relationships with senior executives of the major Hollywood studios and over 600 independent producers and distributors Several major motion pictures have been edited to meet Dove Standards. The 2012 Film Profitability Study documented that Dove approved movies are 3 times more profitable than those that missed the mark. CEO Rolfe was invited to share the findings the VARIETY MAGAZINE Family and Faith-based Entertainment Summit in Beverly Hills. In partnership with Cinedigm Corp, Dove Channel was launched, providing instant access to stream hundreds of Dove-approved films on the web, iOS, Android, Roku and Amazon Prime.